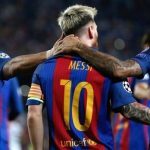 It was the Messi show on Sunday as the five-time Ballon d’Or winner scored three goals and set up two others in Barca’s 5-0 LaLiga demolition of Levante. Messi – who teed up Luis Suarez and Gerard Pique to help Barca restore their three-point lead atop the table – has 14 goals and 10 assists this season, with the superstar the first player in Europe’s top five leagues to reach double figures for both in 2018-19. That’s 50+ goals in eight of the last nine calendar years.